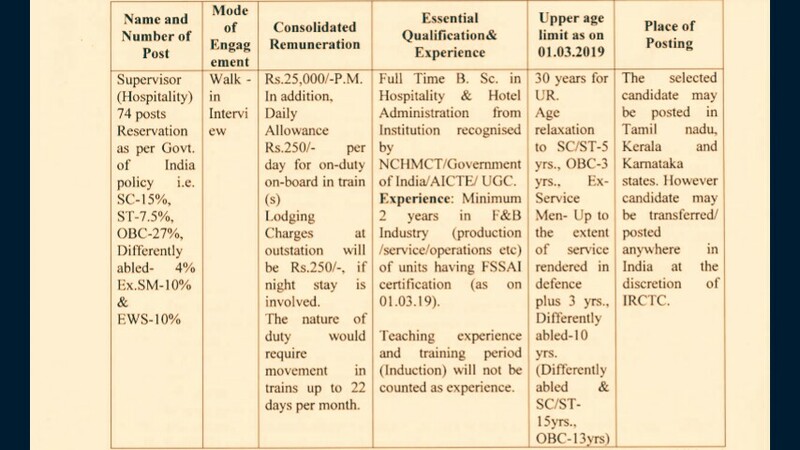 The Indian Railway Catering and Tourism Corporation (IRCTC), Is Looking Forward For An Eligible People To The Post Of Supervisor (Hospitality). So Interested Indians Can Apply For This Job Through Walkin Interview, Details Are Provided Down Below. Supervisor (Hospitality)→74 Walkin Vacancies, Kindly Go Through The Image's Below For Vacancies Distribution, Age Limit, Educational Qualifications, Place Of Posting, Selection Process, Remuneration & Venue/Date/Time Of Walkin Interview. B. Eligible Criteria For Supervisor Vacancies In IRCTC Recruitment Notification 2019. Kindly Do Check Out The Image's Above For Eligibility. Date Of Walkin Interviews→9-12 Of April, 2019. For More Info →The Official Website Of IRCTC. Now Apply For This Job Of IRCTC Supervisor (Hospitality) Walkin Interview Vacancies 2019. Click Here To Download Both Official Offline Application/Notification. Thank You For Your Support And Love, Till Then Stay Safe And Blessed.